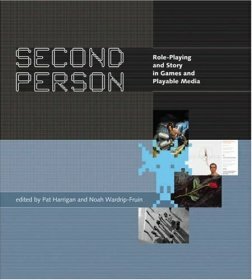 Second Person is a collection of articles, ranging from historical overviews to academic analysis, of games and game design. The book focuses on games played in the second person, where whomever conducts the game -- be it a human Game Master or a computerized storyteller -- addresses the player as “you”. This, in contrast to first-person games, discussed in a previous volume by the same editors. Personally, I found the distinction between the two kinds of games to be somewhat thin; and I was not alone: “We can conclude that the “first-person camera” as it is discussed in games studies and the “second-person narration” of RPGs and IF are not, in fact, two categories, but rather two perspectives on the same category of simulated immediacy.” (Jeremy Douglass, p. 134). The book includes three parts. The first is a discussion of tabletop systems, starting from Dungeons and Dragons and moving forward to more modern role-playing games. The second part deals with “computational fiction”, focusing mainly on interactive fiction games (such as Zork or Planetfall) and their modern, non-commercial descendants, but also dealing with more common computer games, such as Prince of Persia: The Sands of Time and non-gaming computer creations. Finally, the third part is all about real worlds, from live-action role playing games (which, contrary to public image, are more like improv theater than fencing with plastic swords) to mission-based games like I Love Bees. There is also a fourth part, an appendix, which includes the instructions for (almost) three complete games. The articles include historic overviews of different games, considerations of game designers and advice for would-be game designers, as well as profound discussions about the theory of games and the nature of gaming. Some are philosophical and theoretical, others deal with technical and practical issues. While most are enjoyable, I found some of the articles to be long and tedious; in particular, I was bored by several articles on hypertext works and hypermedia art, and I don't really see how they’re related to the subject matter. I also found little interest in the discussions about social aspects of MMOs, but perhaps that’s because I never played any of these games. What articles did I like? Quite a few. In the section about role-playing games, I found much interest in SF author George R. R. Martin’s piece on the Wild Card series of novels, which emerged from his RPG sessions with friends; Jonathan Tweet’s work on character creation in Everway; and Keith Herber’s discussion of the Call of Cthulhu scenario “The Haunted House”. James Wallis’s piece focuses on storytelling as the core of role-playing games, and makes some great arguments. Wallis’s own storytelling game, The Extraordinary Adventures of Baron Munchausen, is included as an appendix, allowing readers (with like-minded friends) to try it out for themselves. In contrast, I think no readers are likely to try out Greg Costikyan’s Bestial Acts game, also included as an appendix. In this game, Costikyan takes a concept first presented in his work on Paranoia -- namely, the players never trusting each other -- to its greatest extreme. The result, a Brecht-like game/play, is entirely unlike Paranoia, being dark and depressing. In fact, the game is so depressing that Costikyan never bothered finishing it, noting that “there patently seems no potential market for a work of this nature” (p. 357). The irony is clear, as Brecht himself vowed to create works that will never be liked by the masses. Still, reading the game description is a thought-provoking experience. In the third part, I loved the articles about A Measure for Marriage (although it seemed rather out of place in this collection) and about Adventures in Mating. I found special interest in the discussion of I Love Bees, presented by Jane McGonigal, one of the game’s inventors. In this games, players blindly follow instructions by invisible “Puppetmasters” (PMs) like McGonigal herself. The question is, why would anyone enjoy such a game, where the player has no choice? Isn't game-playing all about having options to choose from? Quoting Thomas De Zengotita, McGonigal argues that the opposite of “real” is “optional”, so traditional games, “even if they are reality-based or feature the most advanced VR effects, never approach a deep-seated, psychological realism ... [I]n order for a game to truly seem real, it must eliminate the optionality that has so long defined gameplay” (p. 258). Her conclusion is therefore that PM games are the most “realistic” ones. Yet on the other hand, she also discusses the difference between the instructions provided by PMs, and what PMs mean by these instructions, to how players understand these instructions -- sometimes much more literally than the PM ever intended, with preludes like “hold onto your hats, it’s time to drop your pants and dance” causing players to do just that (in public parks, mind you). McGonigal testifies that the PMs “didn't get a rush of power when the players misinterpreted our simple welcome message. We actually felt completely out of control”1 (p. 260). Some critics fear that PM games will lead to a “subservient” population of players, since the players are acting as “docile automatons” (p. 257, quoting Marc Tuters). I wonder if these researchers are also worried about theater actors? In a way, PM games are the exact opposite of improv theater, yet just as theatrical: rather than the director having no advance knowledge of the script, here it is the players that are surprised by it. And PM games certainly take the idiom of the whole world as a stage to its literal extreme. In summary, the book is an uneven but mostly interesting read, especially if, like me, you have enjoyed role-playing and computer games. Note that many (though not all) of the articles can be found online, as a thread in Electronic Book Review. 1 McGonigal’s feelings when players misinterpreted her instructions really reminded me of the AD&D spell Wish -- “Regardless of what is wished for, the exact terminology of the wish spell is likely to be carried through” (first edition Player’s Handbook, p. 94).